Courtesy of André Castelucio, Ilha Grande, Brazil. On January 27th, a group of Brazilian open water swimmers attempted and completed an unprecedented circumnavigation relay around Ilha Grande, an island located 2 km to the Brazilian mainland that was formerly used as a penal colony between 1900 and 1990. Ilha Grande is the largest island in the state of Rio de Janeiro and the sixth largest sea island in Brazil, with an area of 193 km² having rugged and mountainous landscape and officially designated as a prison island swim. Four years ago, Renato Ribeiro, the head coach of the Navegantes Team in the coastal city in Santa Catarina in southern Brazil, had an idea of swimming around the island. At the time, the idea was grandiose and unprecedented. But after a year of intense logistical and operational planning, and with the support of friends Fabio Righetti and Filipe Almeida, and the unique contribution of the sailor Luciano Guerra, he decided to put the plan into action last month. 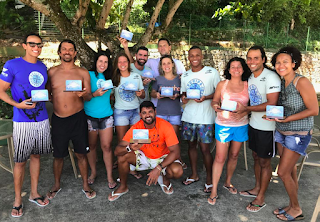 Shortly after the Caraguatatuba x Ilhabela team relay race in the last November, he formally invited the team swimmers who were more involved with this kind of challenge to focus on the execution of this adventurous, audacious plan. 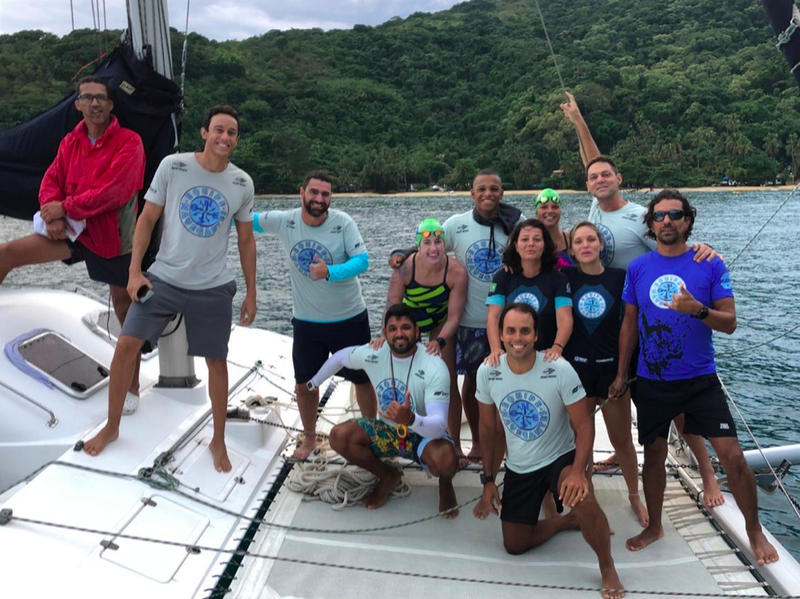 The swimmers were separated into two four-person relay teams with each swimmer swimming in pairs for an hour as they circumnavigated the island. They started to swim at Palmas Beach on January 26th at 7:00 am with the two first swimmers: Liana Lemos and Márcia Pinheiro. They were followed by André Castelucio and Lucas França, then Fabio Righetti and Ivan Nogueira Jr., then André Teixeira and Raphael Maia. Renato recalled, "Everyone accepted promptly the challenge, including Carlos Rosa, who for reasons of health couldn't participate, but was present in each stroke of each athlete. The swimmers faced adverse conditions to complete the challenge including a strong sun, wind, rain, changes in tide, waves, night swimming, and staying awake throughout the time of the challenge. 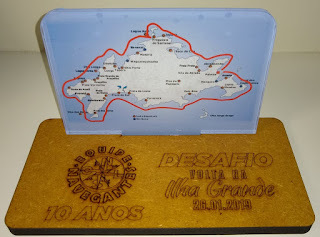 After 24 hours 31 minutes, they completed a 85 km loop around Ilha Grande. It was a great feat that was enabled due to the support of a strategic partnership with Swim Explorer that provided three vessels: the Almar catamarans that were guided by me with the support of Roberta Righetti, Teimosia 1 that was guided by commander Filipe Almeida with the support of Vilma Baptista, and a speedboat that escorted the main boats, strategically positioning themselves at key points for immediate displacement in the event of an emergency."